Since the Bemis Center of Contemporary Arts’ inception in 1981, the venue has been led by only four directors. These include its co-founder Ree Schonlau, currently on its board, who along with husband, artist Jun Kaneko, founded the institution that bears his name just down the block on Jones Street. In 2001 Al Harris-Fernandez, now the Director of the Sioux City Art Center, took over the reins and was soon followed by Mark Masuoka, who left in 2012 to become the Executive Director of the Akron Art Museum. Within a year Bemis’ board of directors hired Adam Price, the former Executive Director of the Utah Museum of Contemporary Art. Four directors in a short 33 years may not seem like a lot but factor in Schonlau’s 20-year stint, a founder’s privilege perhaps, and you may think otherwise. Yet today, five years is considered a long time for art center directors who face a myriad of 21st century issues including: fiscal responsibility/sustainability; program oversight and development in support of a defined mission; public branding/perception; and board, staff, patron and community relations. The truth is, arts directorships are among the more stressful jobs to have and to hold. Just ask Price–which is what the Reader did below–who came on board last year to help Bemis “clarify its mission” amidst budget issues and some pubic disillusionment after recent staff and policy changes. Price recently proved he was up to the task with regard to the latter at least by holding his own in a lengthy Facebook thread regarding the closing of Bemis’ storied Underground. Overall, responding gamely to a vox populi mix of the sublime and the predictable, he reiterated Bemis’ primary commitment to its vaunted residency program. He also laid claim that Bemis’ mission will include time and space for area artists, but not in a way that some may have hoped for. Others may have a similar reaction to changes in the residency program and the venue’s exhibition policy as revealed by Price below. And some may be downright baffled by Bemis narrowing its focus toward what this writer refers to as “advocacy art,” and others refer to as social practice or engagement that places the project, issue or concept on a par with the art created in its interest, thus relegating the art to a means to an end. Yet no one can deny Price’s commitment and conviction that Bemis must evolve in order to stay viable in the 21st century. Director and counselor Price (Harvard Law Degree) makes a strong case. Judge for yourself. MK: How are you surviving after barely a year on the job? AP: I’m loving this place. Seriously. Omaha is amazing, the Bemis is amazing. I haven’t gotten to spend as much time this year with the local arts community as I would have hoped (here’s hoping that the rest of 2014 is better in this regard), but the people I have met are absolutely terrific. Except for that inexplicable air raid siren that I hear from time to time, what’s not to love? MK: What have you learned in such a short time? AP: Omaha is going places. It is really exciting to be here at a time when there is so much energy. It is this mind-boggling mix of grass roots activity and amazing cultural leadership in this town. I know it probably sounds corny, but I’m so grateful just to be here and to be able to participate in everything that is happening. MK: What then will be Bemis’ main focus going forward in the next few years? How has this focus narrowed or clarified compared to when you arrived? AP: I think “clarified” is probably the best word. The primary change that I expect you will see is that all of our activity will now be clearly organized around the residency program, which is the part of the Bemis that has always received the greatest international recognition. So the question for us is how do we continue to do some of the activities that we have always done—exhibitions, community engagement—but do them in a way that reflects the distinctive strengths of the Bemis as a residency program? We have dozens of artists creating new work here all of the time—how can we bring that extraordinary strength to bear on everything that we do? So, just to give you one example, rather than offering completely separate museum-style exhibitions on the main floor, we are thinking about how to design content that focuses less on the finished object and more on the unsettled nature of the creative processes that exist all of the time in our residency program—how artists think, the kinds of choices they make in the process of creating work, the ways in which ideas change as the artist explores the relationship between concept and materials. If we can pull that off, not only would our exhibition program become a meaningful extension of our core artist residency, but it would also make the Bemis exhibition program quite distinct from, and complementary to, exhibition programs at places like the Joslyn. MK: Will residents continue to work independently on their own art or will they be required to interact and connect with other residents there on group projects only? AP: With the elimination of the separate exhibition and community arts departments, we need to acknowledge more explicitly that the goals of artist support and community support are both meritorious and both important to the Bemis at some level. We also need to acknowledge that these goals are sometimes in tension with one another, and try to be as transparent as possible about how we attempt to resolve that tension, hopefully in harmonious ways. One of our recent changes is a resolution by the Bemis board and staff to work with artists, to the greatest extent possible, only on the basis of a residency relationship. This means that when we work with artists in order to accomplish institutional goals or implement institutionally-driven projects, as we always have done in the past and will do again in the future, we will also be inviting them into the residency program and doing our best to support other parts of their practice, just as we do with all of the Bemis residents. We will also be mindful of institutional goals in our residency selection processes. If the Bemis Trustees would like to see Bemis engage with the community—and they do—there are some terrific opportunities to think about supporting a certain number of artists whose practices consist of getting outside of the studio and working directly with a variety of communities in the creation of new work. From our institutional perspective, artists like these can help us meet some of our obligations to the community, while for the artists themselves, the experience will, I hope, still very much feel like complete artistic freedom. MK: In Bemis’ or your view, is the role of the contemporary artist changing and is Bemis attempting to implement this and how so? AP: Society is changing, so the role of contemporary artists is always changing. I don’t know if the Bemis is trying to take a position on those changes, but we are rebalancing our selection process to grab a broader cross-section of the artistic activity that is currently out there in the world. I suppose, from the perspective of people who are accustomed to the Bemis’s recent focus on studio artists in the residency program, that might feel like we are pushing the Bemis in a particular direction. The Bemis will be supporting more conceptual, performative, and socially engaged artists because it will make our artist cohorts more representative of current trends in contemporary art. Also, the addition of these artists will open up new ways for the Bemis to work with the Omaha community. Having said that, I have no doubt that we will continue to support large numbers of studio practitioners, who remain an important and vibrant component of the artistic spectrum. MK: Will Bemis ever or in the next few years exhibit independent shows that do not share this curatorial preference, that is, exhibits not curated by Bemis staff, or those with a non-socially conceptual bent, such as NAC’s Award Winners Exhibit, a juried invitational, an outside curated or traveling exhibit? AP: I think we are trying to make the Bemis model more coherent and more consistently driven by our residency program. Given that shift, it becomes relatively easy to see that outside exhibitions that are unrelated either to our residency program or to the nature of the creative process are a bit outside the scope of our mission. MK: Is it accurate then to say that Bemis’ emphasis will be on greater or more focused curatorial control with artists engaged more on group interaction and directed more toward community based projects than individual objects of art? AP: I think it is fair to say that we are swinging the pendulum back toward the middle, with socially engaged artists now becoming a clearer part of the mix again. If my understanding of the Bemis’s past history is correct, there have been earlier periods in our institutional life where artists were engaged with this community in many of the ways we are currently contemplating. In other words, I don’t really see this change as terribly dramatic in the scheme of the Bemis’ overall history. We are moving from a period of intense focus on studio practice to a period where, as in the art world as a whole, studio practice is part of a larger mix. MK: Will the above be true also of Carver Bank and if so, will its residents have greater access to Bemis facilities and residents? AP: I think the Carver Bank program is a great opportunity to support the artists of North Omaha. What form that support takes will depend, in large measure, on what the artists tell us they want and need. I do want to make sure that we are clearer than we were last year that Carver residents are Bemis residents, and the Carver residents are welcome at the Old Market campus anytime that they feel it would be helpful for them. I think we might have a Carver resident here in the Old Market building at this very moment. As to the other part of your question, it is true that the same tensions I have described at the Bemis exist at Carver also. Last year, we told the Carver residents that they had complete artistic freedom, and then went to find other artists with whom we would work only if they agreed to the basic structure of the programs we wanted to create, including exhibitions for the gallery. Within the current Carver cohort, we have some artists who are very much in a studio mode right now, and others who really think of themselves as both artists and cultural organizers. I think the diversity is terrific and adds to the strength of the program. I think it might also open up different kinds of opportunities to think about the relationship between the creative activity in the back studios and the creative activity in the front gallery. 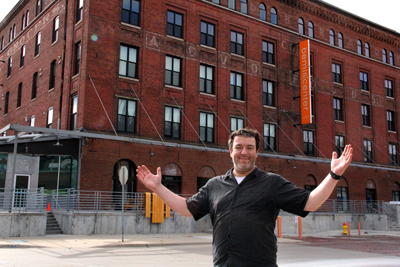 MK: How will Bemis continue to serve and benefit local, regional artists? AP: This is one of the changes I am most excited about. At least in the recent past, the Bemis has had a somewhat ambivalent relationship with the local arts community. For instance, we supported local artists through the Underground exhibition program, but, with a few exceptions, did not let those artists onto the main floor of the Bemis. Nor were we institutionally able to figure out ways to include local artists in the most important part of the Bemis’s institutional life, our global residency program. I think we have an opportunity now to look at a new kind of relationship with the local arts community, and have recently built out several studios for local artists on our residency floors that will allow them to participate in the intellectual community that exists here. It is a great way for Omaha artists to be exposed to a broad spectrum of ideas (which is almost always a pressing problem for artists working in communities that don’t have the kind of critical mass of New York or L.A.), possibly develop new collaborative relationships, and make connections with artists from other parts of the world who may be able to support our local artists in getting their work outside of Omaha. I also think this change will improve the experience of artists who come to the Bemis from other parts of the world and have greater opportunities to interact with and work with local artists who are part of a dynamic cultural environment here. MK: Will they be able to apply for the new studio spaces made available on the third floor or is it by invitation only? Why is this so? What are the goals of these studio spaces? AP: We are rolling out the Nebraska artist program slowly to make sure that we have time to identify and fix any glitches. We also still need to figure out how all of our application processes, including those that may apply to local artists, will be impacted by the changes in the residency program that I’ve been describing. As a result, there is currently no process for open applications at this point. We’ll make more information about the Nebraska residencies available as we learn how those residencies work, and address the inevitable problems that always appear in pilot programs. MK: How do you respond to critics who say that Bemis is now more disengaged from its public compared to its past? How will its public continue to be involved or benefit from Bemis’ evolving mission? AP: If anyone is leveling that criticism—and I haven’t actually heard anyone say that—my response would be that they obviously haven’t visited the Bemis recently. In the last year we have rolled out numerous residency opportunities for local artists (the new Nebraska residencies, the UNL residency prize, the new residencies for North Omaha artists at Carver Bank), with the result that I expect about 20-25% of our total residencies in the coming year will be filled by local artists. We are offering more opportunities than ever before for members of the general public to work shoulder-to-shoulder with our residents in the creation of new work, and to participate in workshops and other programs with the artists of the Bemis. For instance, we just had a group of approximately 30 community members work with resident artist Mary Mattingly for six weeks in the creation of two new versions of Mary’s famous Flock House structures. MK: Is there an auction in Bemis’ future this year, and how will it be composed? AP: We are working out some of those details at present. Personally I’m advocating to separate the historical Bemis art auction into two different events, in order to acknowledge that the auction always served at least two different, and very contradictory, functions. If I get my way—and I don’t always—you’ll see the Bemis do some kind of high-end fundraiser for a relatively smaller group of donors in order to generate significant revenue in support of our programs. Then, on a separate date, you’ll also see an all-out community party where we can thank the community for joining us at the Bemis without needing to charge hundreds of dollars per ticket in order to achieve our revenue goals. MK: Personally, how would you like the community to view and connect with the Bemis as a vital part of the Metro art scene? AP: My thinking about this is still very much in flux, and each new person with whom I am able to talk gives me more data to consider. I hope that we can position the Bemis so that local residents understand the exciting opportunities the Bemis creates for everyone who lives here, and the ways in which those opportunities look completely different than those offered by virtually any other cultural institution in town. So we aren’t a museum and we aren’t an art gallery. We aren’t really even an exhibition venue when you get right down to it, although we have in the past and will continue in the future to offer the public some kind of content in our gallery spaces.